Each of these product types can be set to either digital or physical, and when physical is chosen, you’ll have some additional options under the fulfilment tab to allow you to set up your shipping and fulfilment options. If your main product or bump are set to be a physical product then your checkout will also have the option for additional shipping address collection. 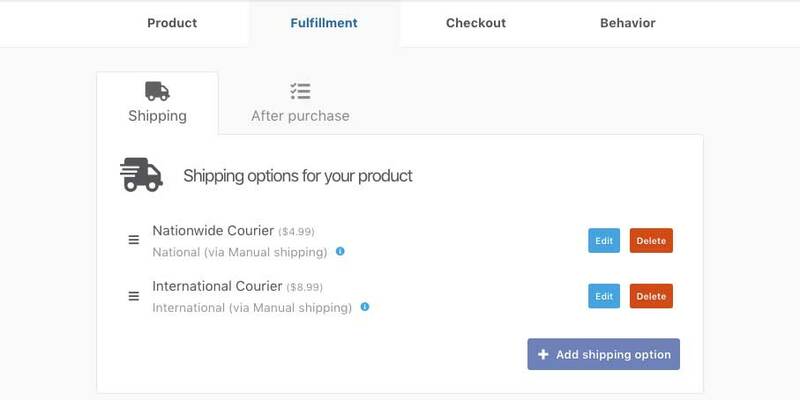 If your upsell/downsell is the only physical product in your funnel, then shipping address can be collected on their respective pages IF you’re not already collecting it at checkout. When creating your main product and checkout, you’ll have the option to choose what type of product you’re setting up. If you need to change this in the future, you can. So don’t worry if you change your mind later and want to convert it into a physical product with shipping options. Wanting to edit an existing product and convert to a different type? Select the option bottom left of your product settings first tab. Enabling the bump on your product will give the option of selecting a digital or physical product type like when you created your main product. Should you need to, you can edit/change product type by clicking the edit button to the side of the product type. When creating your upsells and downsells you’ll be greeted with the same modal prompt where you can choose the product type and you can then change the product type if required on the first tab of your upsell/downsell settings. If you have any questions or need help setting up your products, please contact the friendly support team directly and we’ll be happy to help.